Cooking at the Baker's. The Industrial Revolution brought many families to the towns. 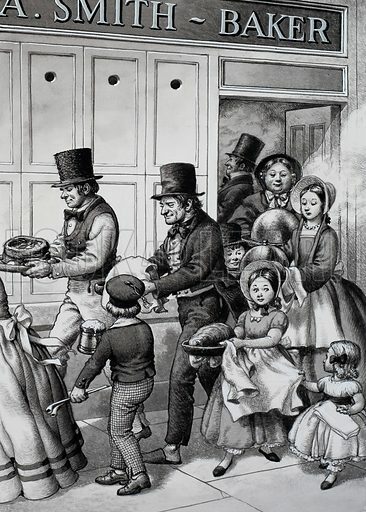 They missed their big country ovens, so the traditional Sunday dinner for the working classes was cooked in the ovens of the local baker, who collected a few coppers for each dish. This is a typical Sunday midday scene in one of the larger towns. Original artwork for illustration on p33 of Look and Learn issue no 712 (6 September 1975). Available worldwide for immediate download up to 3,382 x 4,732 pixels.